Deluxe selectie van koud seafood waaronder haring, garnalencocktail, Noordzee krab, gerookte zalm, gekookte garnalen, tonijnsalade en diverse schelpdieren. Royale selectie van koud seafood waaronder haring, garnalencocktail, Noordzee krab, gerookte zalm, gekookte garnalen, tonijnsalade en diverse schelpdiere Plus: 100 gr. king crab p.p., halve kreeft p.p., twee oesters p.p., huisgemaakte krabsalade en 1 langoustine p.p. Mix van verschillende seafood taco’s. After many years of hard working as the captain on the crab fishing boat ‘Mr. Crab’, in the coldest and stormiest waters on earth, the captain choose to follow his true passion, cooking! Because the life of a (crab)fisherman is very tough and full of dangers on deck, and the fishermen always have to push themselves to the limit under extreme circumstances. They need to eat nutricious and healthy food. Our captain, Mr Crab, took this very serious when cooking for his crew. Everyday he took fresh fish or crab from the catch of the day, mixed them with the best fresh vegetables and herbs and added his passion and love to it. His crew often said they ate better on the boat than home ashore! This made the Captain thinking and therefore he took it upon himself, as a mission, to share his passion and love for nutricious and healthy seafood with the rest of the world ashore. 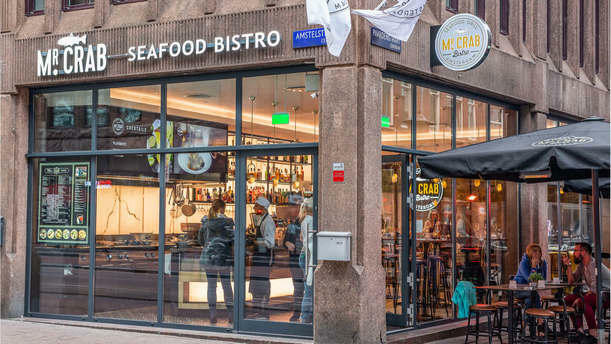 He chose Amsterdam as the location for his restaurant Mr Crab to reach as many people as possible. That’s might just be the secret which makes the seafood at Mr Crab so unique. Great place with fresh fish and a very dedicated team to satisfy clients. Thanks ??? ?